All the News in Witty Print. Quality Reading Material for the (M)asses Since 2000. Of spoils (for everything spoils, what doesn't toil). A toll they want from me, but cannot get, from a teenager. “The trading week was shortened by a historic two-day market closure on Monday and Tuesday, spurred by superstorm Sandy's devastating sweep through the U.S. Northeast. Khakjaan Wessington is America's most irritable poet. All content on Toylit is its copyrighted property, the copyrighted property of its licensors and used with permission, or the copyrighted property of its authors, as attributed. Unauthorized use or distribution is prohibited. Toylit publishes anti-news: that is, literature that rejects the conventional, reactionary standards in journalism. Toylit seeks verse and has a soft spot for short fiction. Literary submissions only. Expository/Journalistic submissions will be rejected, regardless of quality. All submissions should be in the body of the e-mail. Submissions that do not conform with this standard will be rejected. Enclose a bio of up to 100 words if you wish, especially links to past work. By submitting to Toylit, you agree to give us First Serial Rights if you are accepted. I'm willing to negotiate this for exceptional cases, but don't waste my time. ps: Some of you are submitting verse and prose without any attention to Toylit's theme. I'm glad to publish a great poem or story, but not many people can write those. You can increase your odds of acceptance by writing anti-news; a literary composition that riffs off the news. If you don't know what anti-news means, you should read Toylit until you do. 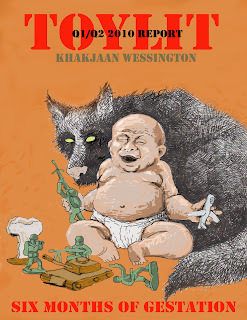 Copyright 2010, Khakjaan Wessington. Simple theme. Powered by Blogger.